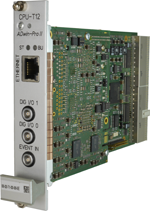 The processor module, the ADwin CPU, is the center of each ADwin-Pro II system. It executes the ADbasic instructions and accesses the inputs, outputs and interfaces of the other modules. The processor modules Pro-CPU-T12 and Pro-CPU-T11 offer highest real-time computing power and are largely software-compatible to previous versions. 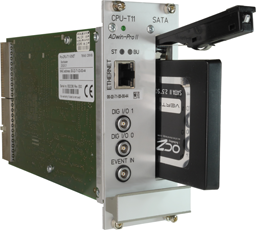 The SATA device can be integrated into the module or removable. Access to the memory is provided via processor module or via NFS / SMB from the Ethernet network. Please, request further information here.